Let your crafting juices flow and turn everyday household objects into conversation starters on your coffee table or, or striking serving dishes for your dinner parties. Bring the wow factor to any craft project you have planned. Apply them to furniture or even sections of wall in your house. The possibilities are endless! 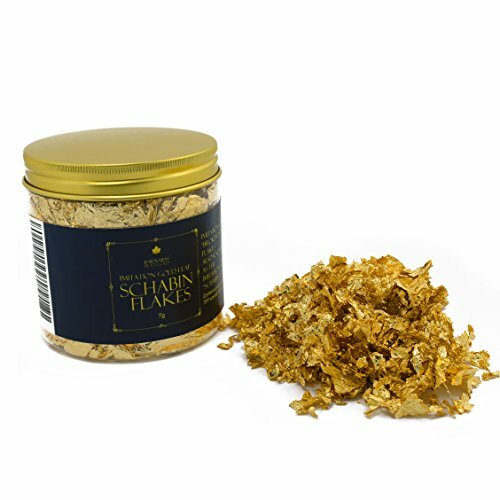 If you are in the arts and crafts business selling your own handmade designs, these schabin flakes will make every piece you create unique and certainly help them stand out from the crowd. Whilst professional artists and sculptors may use this product, you certainly do not need to be an experienced gilder to work with it. It can be applied using standard gilding size (adhesive) and simple gilding techniques. And of course, adding it to homemade slime could not be easier but watch their faces light up when you do! FREE pair of cotton gilding gloves! And just to help get you going, we have included a free pair of cotton gilding gloves. It's not quite the full kit but once you have the gilding glue and brush or even a glue pen, you're ready to go.